Bruce Willis has taken Hollywood by storm, starring in over 60 films and with multiple awards under his belt, including a prestigious Golden Globe; he most definitely is everyone’s favourite hard man. To celebrate the release of his new film, Marauders in cinemas today, we can reveal our top five Bruce Willis roles. 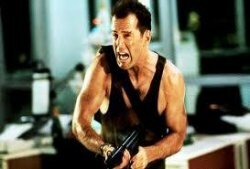 With over five blockbusters in the franchise and another rumoured in production, there is no doubt that Officer John McClane is one of the ultimate Bruce Willis roles. Starring alongside the late Alan Rickman as the frightfully villainous German terrorist Hans Gruber, NYPD Cop John (Willis) must go to any length to save his wife and the rest of her colleagues after they were taken hostage at their Christmas party at mega corporation Nakatomi. Bruce’s break out role has been widely regarded as the best action film of the 1980s and most definitely his most memorable role. Starring in arguably Quentin Tarantino’s finest film, Bruce Willis stars alongside a phenomenal cast including John Travolta, Uma Thurman and Samuel L. Jackson, as boxer Butch Coolidge. After making a bet with Marsellus to purposely lose a boxing match, Butch has a change of heart after a vivid dream about a gift of a Gold Watch he received from his Grandfather; instead he fights so vigorously that he ultimately kills his opponent. On the run from Mob Boss Marsellus, he ends up in a basement with him and from there on, in true Tarantino style, there is endless violence and gore and Bruce’s performance is truly second to none. Tarantino claimed, after casting Bruce as boxer Butch Coolidge, had made the film ‘legit’ and well, you can’t argue with that. Bruce stars as a heroic driller turned astronaut in this apocalyptic thriller, which doesn’t leave a dry eye in sight. 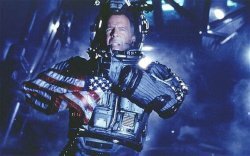 When NASA discovers that an asteroid the size of Texas is rocketing towards Earth holding the capacity to destroy the planet, there is only one person who can stop the asteroid eliminating all humanity: Harry Stamper. With only 18 days to save the planet, the only way to prevent catastrophe is to launch a nuclear bomb an eye-watering 800 feet away from the asteroid to split it in two; a risky and extremely dangerous task and one that can only be accomplished by our hero and his team of cohorts. However when tragedy strikes Harry pays the ultimate sacrifice for his beloved daughter. The second highest grossing film of 1999, The Sixth Sense is Bruce Willis’ most chilling performance as child psychologist Dr. Malcom Crowe. When he is sent to Cole, a young boy who claims that he can interact with dead people, he is fascinated and spends more and more time with him in an attempt to understand his ‘Sixth Sense’, much to the dismay of his wife. What happens next shocked all movie goers and ultimately beating Alfred Hitchcock’s Psycho to be awarded with the biggest film shock of all time and definitely confirmed Bruce Willis’ credibility as an actor. 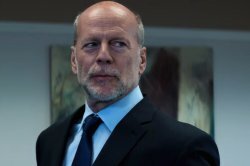 In his latest role as high flying bank owner Hubert, Bruce Willis stars in Marauders, a high action crime thriller that will have you on the edge of your seat. Directed by Steven C. Miller and starring Christopher Meloni, Dave Bautista and Adrian Grenier, it is sure to be a box office hit. After a bank is targeted by a group of very highly trained robbers they successfully execute a highly complex heist stealing millions in cash. When the FBI investigate further, they realise that there is more to this story than meets the eye. Bruce’s role is cunning and manipulative and the perfect film to watch when it’s released on 26th December. Available on Blu-ray™, DVD and digitally from February 20, 2017.